Once upon a time, in a small college town in north-central North Carolina, your correspondent was a Man-About-Town of sorts, the type who knew bartenders by name and who could walk into any music club on West Franklin Street and find familiar faces there to share a round and a few laughs with. "Da-da, you don't have any friends." Harsh words for anyone, no doubt, but more so coming from one's four-year-old son. But he's right, you know. Sure, I have my colleagues at work, and good people they are, but let's just say that geneticists, oncologists, and epidemiologists aren't really deserving of their outrageous party-animal reputation, and most of them are considerably older than me as well. So no, I don't really have anyone in France that I hang out with, per se, nobody who'd be interested in, for example, watching the AFC Championship game on Monday night at 11:30 on France4 (yeah, I already know who won) or going to see The Rapture at the Ninkasi concert hall (not that I'm a big Rapture fan, but few enough American bands make it to Lyon that you've got to take your opportunities, even if said bands' last two albums haven't lived up to the promise of their debut EP). In fact, the person in France with whom I spend the most time has to be in bed by 9PM, and I read him a bedtime story if he's eaten all his fish sticks, taken his Flintstone vitamins, and gone potty by himself. So yes, a typical big weekend night for me consists of an old French-subtitled movie on TV, maybe an episode of Battlestar Galactica if the latest one is up on YouTube, and a few glasses of something-or-other. And this, dear reader, is where you benefit from my tale of woe. Living in France has given me the opportunity to sample many many different and unusual glasses of something-or-other, some of them rare, prohibitively expensive, or just flat-out illegal in the USA. So in what I hope to offer as a recurring feature, Drunkblogging will present a specific potent potable as I try it for the first time, in real time (more or less...I'll probably just type as I go and post the thing the next day). What's so exotic about Chartreuse? Heck, you can pick it up in pretty much any liquor store in the States, right? Well, not exactly. 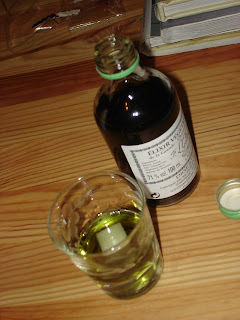 What they sell in the States is Green Chartreuse, which is a watered-down, less-alcoholic, sweetened version of the original Chartreuse Elixir. The elixir has a backstory (nicely summarized here) involving an ancient manuscript, alchemy, secret societies, and a secret formula that is known by only two living men at any one time--and those two men are monks sworn to silence and living in a remote monastery between Lyon and Grenoble. What they produce according to this formula, using 130 different botanicals, is 142-proof brilliant-green alchemy in a six-ounce bottle. 11:47: How do I open this thing? [see top pic.] What looks like a cap isn't. It's as if it were turned on a lathe from a single block of wood. After a moment when I consider drilling open the top, I find the seam cleverly hidden under the green tape. 11:49: I twist off the cap and take a whiff. It smells like... cough medicine. Robitussin DM, in fact. V takes a sniff and confirms--a little bit Robitussin, a little bit Vicks Vap-O-Rub, with a touch of tiger balm mixed in. She also comments that the color looks like distilled spinach. 11:56: Here's the setup. 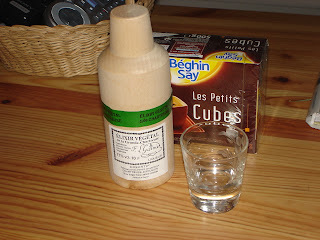 I drop a sugar cube in the shot glass, then pour a reasonable-looking amount of the Elixir of Long Life over it. Do I wait for the sugar cube to melt or what? At midnight I'm drinking this sucker. 12:00: First glass. It tastes like I just drank an Alpine forest. It's so alcoholic--142 proof-- that it immediately dissipates into vapors as soon as it hits the soft tissues of the mouth. Not unpleasant but a little disconcerting at first; I don't remember if I actually swallowed or if I just absorbed it. As for the taste, it is extraordinarily complex. Why, there probably are 130 different botanicals in there! It's just that it's hard for one's taste buds to sort them out. Menthol, anise, juniper definitely in the mix. 12:02: As an added bonus, my nasal passages seem to have miraculously cleared. 12:07: Do I feel more alive? Elixirated? I dunno. A little spacey, maybe, as if I had just slammed 2 shots of vodka in quick sucession (which I did, more or less). 12:12: V keeps looking into my eyes as if she expects them to turn green or have pinpoint pupils or something. "Anything?" she asks, "Anything? Maybe you'll have extra-wierd dreams tonight." She gets bored of waiting for me to turn into Mr. Hyde and wanders off to download a movie to watch. 12:19: OK, I'm going to have another one. There's good pharmacological science for you...if therapeutic results not immediately obtained, double the dosage. 12:30: Second glass. Again, the flavors are intriguing but they rush past so quickly it's hard to get a handle on them. I can see why the monks made a mellower version that is more suited to contemplative drinking. You can't really hold this in your mouth and move it around like it was wine. I do feel somewhat revitalized, awake. Placebo effect? I'm also very aware of my breathing, as if my lungs were extra-clear or my bronchial tubes extra-dilated. Kind of like when you take that weird trucker speed you buy at truck stops on I-85 to stay awake at night, not that I've ever done that. 12:38: You know, the high alcohol content seems to have made my throat a little dry. I sure would like a nice cold beer. 12:42: Speaking of ancient manuscripts, V has downloaded The DaVinci Code (in a completely legal and copyright-respecting manner, bien sur). Wanna watch? Er, I guess. Lemme grab a beer from the fridge first. Enjoyed this one. Look forward to more drunkblogging. Did/will you finish off the bottle? 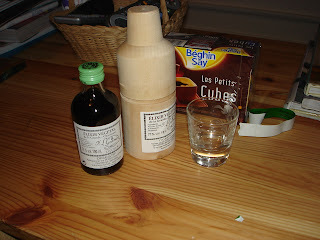 Do you know who drinks Chartreuse these days in France -- hip young things, crotchety intellectuals? You had the Absinthe on hand when we were there, no? Maybe start earlier than midnight. Yeah, I've had the absinthe for a while...I've been waiting to dig in to it until I had a night with nothing to do the next day. Those, unfortunately, are pretty rare. I really have no clue who drinks Chartreuse these days, as I haven't really seen people buying it in stores or ordering it at bars. So I guess your answer is "incredibly cool American expats such as, well, myself."